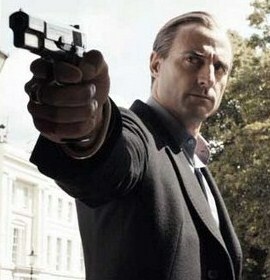 British actor Mark Strong (born Marco Giuseppe Salussolia on 5 August 1963) is especially known for his villainous performances  such as Prince Septimus in Stardust or Lord Blackwood in Guy Ritchie's Sherlock Holmes  though he's been playing the Knight in Shining Armor, a morally gray hitman, and pretty much everything in between as well. See (incomplete) list below. If Guy Ritchie or Matthew Vaughn is working on a new project, it's safe to say that they at least consider their friend for a part in it. Low Winter Sun (2013) - Frank Agnew (based on the 2006 British miniseries of which he played the same character). Ambiguously Brown: This Austro-Italian Englishman has portrayed Jordanian and Lebanese men. Badass Baritone: All he needs is an echo-y place to sound even more intimidating. Bald of Awesome: He even said in a few interviews that losing his hair helped transition him from one-note lovers into the juicier villainous roles. Evil Brit: He even provides part of the page quote. Sharp-Dressed Man: Archie in Rock 'n Rolla takes the cake. Smoking Is Cool: A few of his characters fall under here, but particular notice goes to Dr. Neil Barnard from Endgame, who snaps the filters off of his cigarettes before lighting up. Star-Making Role: Septimus in Stardust, the role that kick-started his career as a villain actor. Those Two Actors: With Colin Firth in Fever Pitch, Tinker, Tailor, Soldier, Spy, Before I Go To Sleep and Kingsman: The Secret Service. What Beautiful Eyes! : Especially noticeable here , here , and here .